When you are creating figures in the Figure Editor, you may not want just isolated points, lines, circles, etcï¿½. You might want to attach one of these objects to another. Points, lines, arrows, circles, and arcs can be attached to other points, lines, arrows, circles, and arcs. Click and drag one of the objects on top of the other object and a blue highlighted circle will appear. If you stop dragging the object while it is over another object and highlighted, the two objects will merge. For example: You may want to attach a line to a circle to create a radius for that circle. 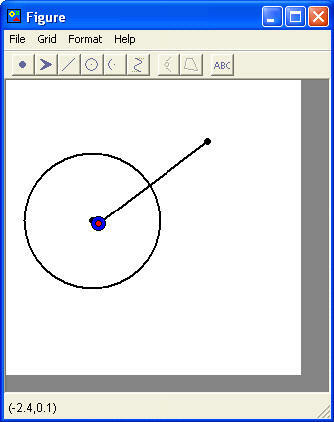 Next Click on one of the points of the line and Drag that point over the center of the circle until the blue highlighted circle appears, then Release the point. Click and Drag the other point of the line over the outside of the circle and Release the point when the blue highlighted circle appears. The line is now attached to the circle. You have a radius that will move and resize with the circle.